Whether you sweat profusely or have stared perplexedly as sweat pours from someone in an air-conditioned room, no one is safe from the misconceptions associated with excessive sweating or hyperhidrosis. 1. Excessive sweating signals poor hygiene. Excessive sweating – or perspiring more than is needed to regulate body temperature – has nothing to do with hygiene. Before developing and religiously wearing the Thompson Tee, I used to shower two to four times a day, change my shirt every few hours and slab on ridiculous amounts of antiperspirant just to stay semi-dry, but I simply couldn’t control my sweating. This false association with poor hygiene couldn’t be further from the truth. 2, Only overweight people suffer from hyperhidrosis. While excessive sweating is more common among those who are overweight or out of shape, hyperhidrosis can affect people of all sizes and ages. Often, profuse sweating can indicate more serious diseases such as diabetes or thyroid problems, but hyperhidrosis is separate from these illnesses. 3. Sweat causes body odor. Although a foul smell is typically associated with sweating, sweat itself is actually odorless. The pungent odor you may notice after an intense sweat event is actually the product of your sweat mixing with bacteria on the skin. 4. Hyperhidrosis isn’t a serious or life-altering condition. From the outside, sweating may seem like a harmless personal problem. 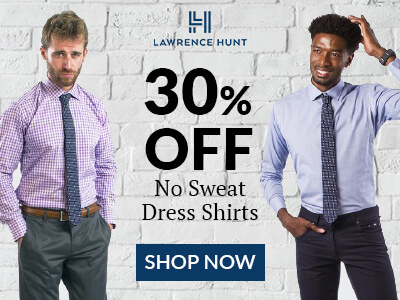 But constantly sweating through your shirts – regardless of the temperature – is more than a nuisance; it can also inflict serious psychological damage on a person. Growing up with hyperhidrosis, my co-founder Randy and I had to shape our lives around our profuse sweating by avoiding certain social situations, layering up even in extreme heat and arming ourselves for the day with “sweat kits.” Constantly fretting over the appearance of sweat marks and stains (or when they might decide to show up) became mentally draining. 5. People sweat the most in their armpits. The average person is born with about two to four million sweat glands, but less than 1 percent of sweat comes from the armpits. Because sweat cannot escape as easily from this confined space, it creates a pooling effect you may feel from time to time - or every day for excessive sweaters. 6. Excessive sweat indicates an overly nervous or anxious person. While anxiety can exacerbate sweating, the sweat associated with hyperhidrosis can strike at any moment. Simply going through the motions at work or at home can ignite the water works. There is really no controlling it - only subduing the sweat by keeping calm and not letting anxiety about sweating intensify the problem. 7. Something must be “wrong” with a person who excessively sweats. Nothing is worse than an entire room full of people studying your sweat-marked shirt in disbelief. Both Randy and I have experienced blank stares and people asking if we’re OK after a sweat attack comes on. And the attention is anything less than glamorous. It’s time to reverse this misconception and educate others on what excessive sweating actually is - a medical condition that cannot be helped. Drawing undue attention to the situation is never the answer. Sweating is a natural, everyday occurrence whether you realize it’s happening or not. Hyperhidrosis occurs when the brain signals the body to produce more sweat than it requires – it’s not the result of poor hygiene, inactivity or anxiousness. Those who have to live with this condition understand the stress and self-consciousness that can eat away at your mood and demeanor every day. So instead of fueling the fire – let’s finally put these false notions to rest!